Stud Poetry is a playful word toy that enables the reader to build a five-card hand of poetry in the form of a poetry game with some greats from the past. 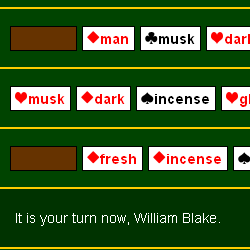 Each player is dealt cards with a single word substituted for a number. These form the randomized basis for both a line of poetry and a poker hand that you can bet on. Author description: Stud Poetry is a poker game played with words instead of cards. Your goal is to build as strong a poetry hand as you can and, of course, to win as much money as you can. Stud Poetry is a game of courage and faith, and a bit of luck too. To become a great master of Stud Poetry, you need to believe in the power of words, their magic capability to move mountains, minds, and souls. Surely it won't be easy, but when you finally have won all the money with your wonderful five-word poetry hands, you'll know it's worth it. Instructions: Stud Poetry is a version of the poker game, "Five Card Stud," played with words instead of cards. All players start with 100 chips, and may bet, call, raise, check, and fold throughout the rounds of betting in accordance with the normal rules of poker. The relative value of the words is randomly assigned each time Stud Poetry is started. Previous publication: "Stud Poetry" appears for the first time here in the Electronic Literature Collection, volume 1.